For more on the following training circular, see Steven Aftergood’s post on Secrecy News. TC 2-91.4 provides intelligence professionals a basic framework within which to focus on providing commanders with effective intelligence support for operations in the urban environment. This manual incorporates intelligence and operational doctrine and terminology from FM 3-06 and ATTP 3-06.11. The principal audience for TC 2-91.4 is intelligence staffs and Soldiers of units conducting intelligence support to operations in the urban environment. It can also be used by commanders, staffs, and intelligence personnel at all echelons. With the continuing growth in the world’s urban areas and increasing population concentrations in urban areas, the probability that Army forces will conduct operations in urban environments is ever more likely. As urbanization has changed the demographic landscape, potential enemies recognize the inherent danger and complexity of this environment to the attacker. Some may view it as their best chance to negate the technological and firepower advantages of modernized opponents. Given the global population trends and the likely strategies and tactics of future threats, Army forces will likely conduct operations in, around, and over urban areas—not as a matter of fate, but as a deliberate choice linked to national security objectives and strategy. Stability operations––where keeping the social structure, economic structure, and political support institutions intact and functioning or having to almost simultaneously provide the services associated with those structures and institutions is the primary mission––may dominate urban operations. This requires specific and timely intelligence support, placing a tremendous demand on the intelligence warfighting functions for operations, short-term planning, and long-term planning. Providing intelligence support to operations in the complex urban environment can be quite challenging. It may at first seem overwhelming. The amount of detail required for operations in urban environments, along with the large amounts of varied information required to provide intelligence support to these operations, can be daunting. Intelligence professionals must be flexible and adaptive in applying doctrine (including tactics, techniques, and procedures) based on the mission variables: mission, enemy, terrain and weather, troops and support available, time available, and civil considerations (METT-TC). As with operations in any environment, a key to providing good intelligence support in the urban environment lies in identifying and focusing on the critical information required for each specific mission. 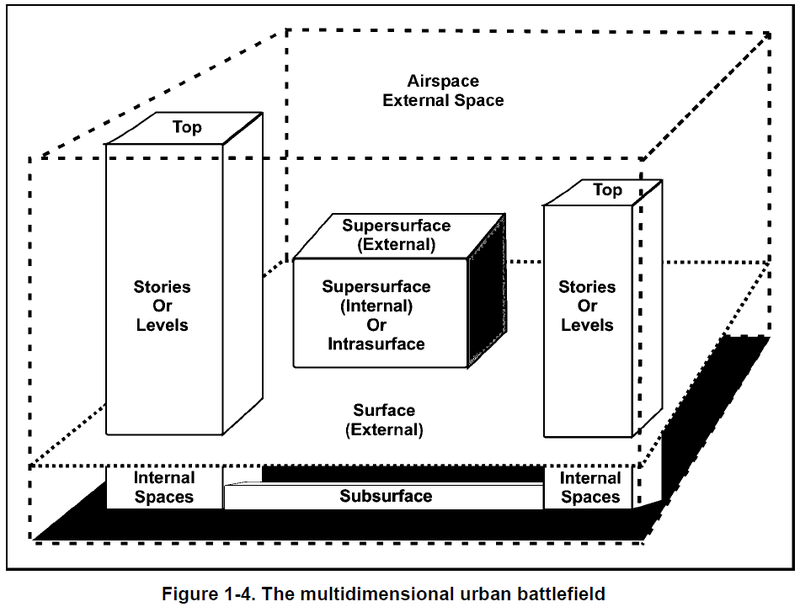 The complexity of the urban environment requires focused intelligence. A comprehensive framework must be established to support the commander’s requirements while managing the vast amount of information and intelligence required for urban operations. 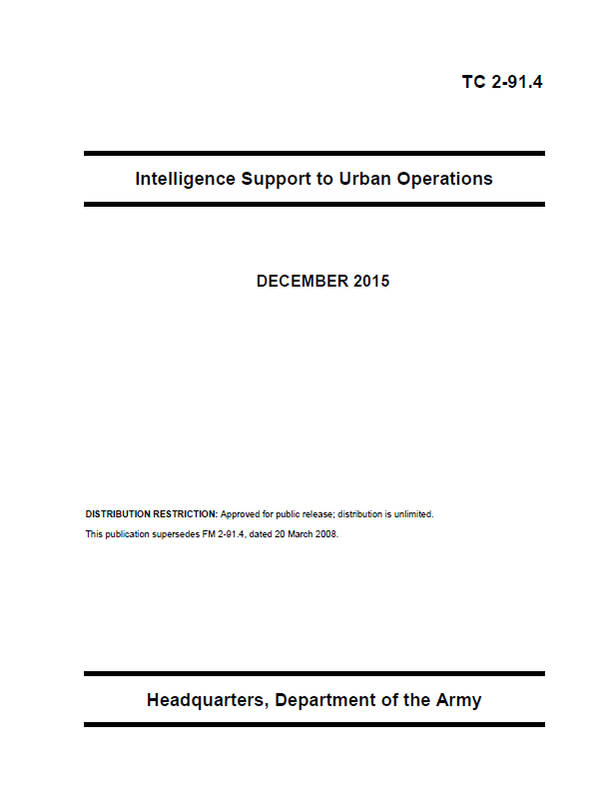 By addressing the issues and considerations listed in this manual, the commander, G-2 or S-2, and intelligence analyst will be able to address most of the critical aspects of the urban environment and identify both the gaps in the intelligence collection effort and those systems and procedures that may answer them. This will assist the commander in correctly identifying enemy actions so that Army forces can focus on the enemy and seize the initiative while maintaining an understanding of the overall situation. FM 3-06 and ATTP 3-06.11 provide supporting material relevant to this manual. The following manual was released by the U.S. Army on February 12, 2014. The manual was first reported by Steven Aftergood of the Federation of American Scientists. 1-1. 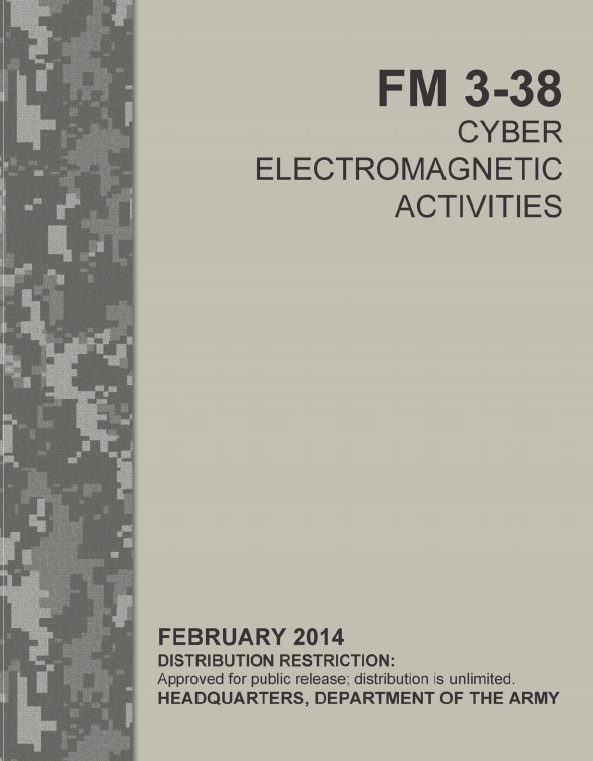 Cyber electromagnetic activities are activities leveraged to seize, retain, and exploit an advantage over adversaries and enemies in both cyberspace and the electromagnetic spectrum, while simultaneously denying and degrading adversary and enemy use of the same and protecting the mission command system (ADRP 3-0). 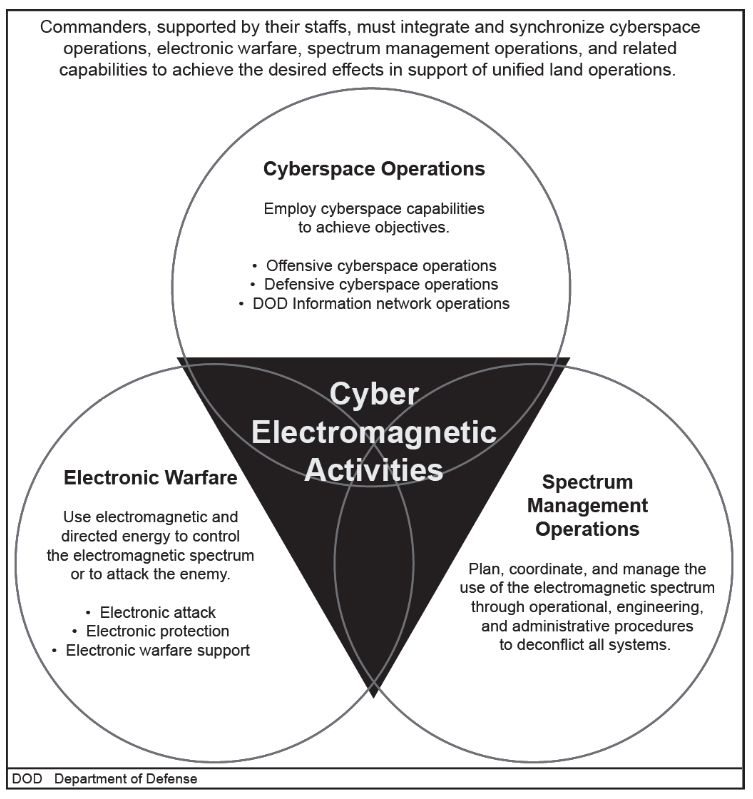 CEMA consist of cyberspace operations (CO), electronic warfare (EW), and spectrum management operations (SMO) (see figure 1-1 on page 1-2). 1-2. Army forces conduct CEMA as a unified effort. Integration is the arrangement of military forces and their actions to create a force that operates by engaging as a whole (JP 1-02). Synchronization is the arrangement of military actions in time, space, and purpose to produce maximum relative combat power at a decisive place and time (JP 1-02). CEMA integrates and synchronizes the functions and capabilities of CO, EW, and SMO to produce complementary and reinforcing effects. Conducting these activities independently may detract from their efficient employment. If uncoordinated, these activities may result in conflicts and mutual interference between them and with other entities that use the electromagnetic spectrum (EMS). CO, EW, and SMO are synchronized to cause specific effects at decisive points to support the overall operation. 1-4. Cyberspace operations, EW, and SMO are essential to the conduct of unified land operations. While these activities differ in their employment and tactics, their functions and capabilities must be integrated and synchronized to maximize their support to unified land operations. The integration of these activities requires an understanding of the functions and capabilities being employed. 1-5. Cyberspace operations are the employment of cyberspace capabilities where the primary purpose is to achieve objectives in or through cyberspace (JP 3-0). 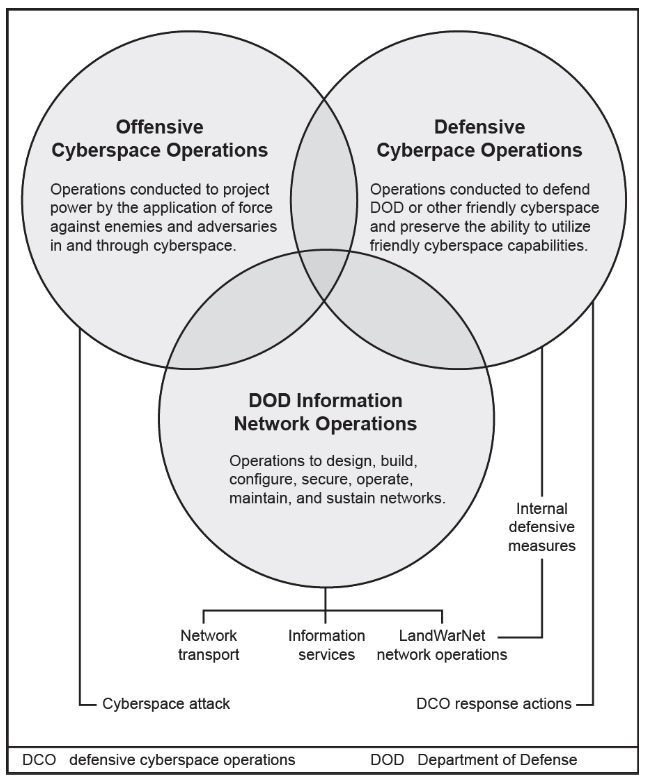 Cyberspace operations consist of three functions: offensive cyberspace operations, defensive cyberspace operations, and Department of Defense information network operations (see chapter 3). 1-6. Electronic warfare is any military action involving the use of electromagnetic and directed energy to control the electromagnetic spectrum or to attack the enemy (JP 3-13.1). EW consists of three functions: electronic attack, electronic protection, and electronic warfare support. These functions are referred to as divisions in joint doctrine (see chapter 4). 3-1. Army forces coordinate and integrate CO through CEMA. They do this to gain and maintain freedom of action in cyberspace and as required to achieve periods of cyberspace superiority. 3-2. Cyberspace superiority is the degree of dominance in cyberspace by one force that permits the secure, reliable conduct of operations by that force, and its related land, air, maritime, and space forces at a given time and place without prohibitive interference by an adversary (JP 1-02). Such interference is possible because large portions of cyberspace are not under the control of friendly forces. Cyberspace superiority establishes conditions describing friendly force freedom of action while denying this same freedom of action to enemy and adversary actors. Ultimately, Army forces conduct CO to create and achieve effects in support of the commander’s objectives and desired end state. 3-3. CO are categorized into three functions including offensive cyberspace operations (OCO), defensive cyberspace operations (DCO), and Department of Defense information network operations. These functions are described in joint doctrine as missions in cyberspace that require specific actions in cyberspace (see joint doctrine for CO). Figure 3-1 on page 3-2 depicts the three interdependent functions of CO.
3-9. Using specific portions of cyberspace and the electromagnetic spectrum (EMS) as primary pathways or avenues of approach, cyberspace attacks may employ capabilities such as tailored computer code in and through various network nodes such as servers, bridges, firewalls, sensors, protocols, operating systems, and hardware associated with computers or processors. Tailored computer code is only one example of a cyberspace capability (a device, computer program, or technique, including any combination of software, firmware, or hardware) designed to create an effect in or through cyberspace. The development and employment of tailored computer code represents the core and unique technical nature of CO capabilities. Computer code is designed to create specific effects, and when employed this code moves in the form of data packets in and through cyberspace across wired and wireless driven communication technology and systems. Cyberspace attacks must therefore be coordinated and integrated in support of the commander’s objectives and consistent with applicable assessment measures and indicators. 3-10. Cyberspace attack capabilities are employed to support maneuver operations by creating simultaneous and complementary effects. For example, a cyberspace attack capability may be employed in conjunction with electronic attack, offensive space control, fires, and information related capabilities to deceive, degrade, destroy, and disrupt a specific enemy integrated air defense system or enemy safe haven (see table 3-1 on page 3-4). States, congressional critics said yesterday. "It seems to me the damage done to a free press is substantial," said Rep.
Zoe Lofgren at a hearing of the House Judiciary Committee. not include their contents. It was a "massive and unprecedented intrusion"
General James M. Cole in a May 14 reply. Holder. He did not elaborate. especially but not only in national security reporting. relationship with the press," Rep. Lofgren said yesterday. classified information, including in the present case. very concerning, and hurt our country,' end quote." The irony was not lost on Rep. Jerrold Nadler. that the catalog record describes." Congress has declined to make publicly available include the following. electronic surveillance were denied by the Court. search were disapproved or modified. the 205 the year before. the 16,511 requests (concerning 7,201 different persons) the year before. no known results to date. of the mandatory budget cuts known as sequestration. Records Administration (NARA) said in a report last week. effects of the across-the-board cuts. reduction in the rate at which new records are classified. declassification requirements to go overlooked and unenforced. state of post-revolution Egypt and finds it fairly grim. collapse and possibly new levels of violence,” the report says. report from the Congressional Research Service. rules-based system for international investment,” the new report explains. report) in a newly updated report on FBI terrorism investigations. Other new or newly updated CRS reports include the following. Other noteworthy new or updated DoD issuances include the following.